WASHINGTON - On March 22, 2001, the U.S. Postal Service and Sweden Post will jointly honor the centennial of the distinguished Nobel Prize by issuing commemorative stamps engraved by Czeslaw Slania, the world-famous, Polish-born, Swedish stamp engraver. The American and Swedish stamps will be dedicated together at the Nobel Foundation in Stockholm, Sweden, and on the same day in the United States at the Smithsonian's National Museum of American History (NMAH). "We take great pride in honoring perhaps the most coveted award in the world," said S. David Fineman, Vice Chairman of the U.S. Postal Service's Board of Governors, adding that "this is a tremendously important and exciting occasion in both Sweden and the United States." Governor Fineman will dedicate the U.S. stamp in Stockholm. The Nobel Prize established in the will of Swedish-born inventor and industrialist Alfred Nobel (1833-1896) is presented annually on Dec. 10, the anniversary of Nobel's death. A Nobel Prize winner receives a gold medal, a diploma and a check. Designed by Olf Baldursdottir of Stockholm, Sweden, the U.S. stamp depicts a profile portrait of Alfred Nobel and two gold medals. In the center is the gold medal awarded for physics, chemistry, physiology or medicine, and literature, designed by Swedish sculptor and engraver Erik Lindberg. On the left is the gold medal awarded for peace designed by Norwegian sculptor Gustav Vigeland. The Nobel Foundation has awarded prizes for outstanding achievement every year since 1901. To date, more than 250 Americans have received Nobel Prizes. "We are pleased to join the U.S. Postal Service in Washington, D.C., and honored to welcome Governor Fineman to Sweden," said Jan Eliasson, Swedish Ambassador to the United States. "We are very proud of the commemorative stamps that will be issued in both our countries. It is wonderful that we have the opportunity to symbolically represent those whose magnificent achievements have made such remarkable differences to our world." Ambassador Eliasson will join Deputy Postmaster General and Chief Marketing Officer John M. Nolan of the United States Postal Service to dedicate the stamps at an 11:00 a.m. ceremony in the Carmichael Auditorium of the Smithsonian's National Museum of American History, 14th & Constitution Ave., N.W., Washington, D.C.
"Nobel Voices: Celebrating 100 Years of the Nobel Prize," sponsored by the Smithsonian's Lemelson Center for the Study of Invention and Innovation, will open April 26 at the NMAH. "The exhibition will present, in their own words, the stories of Nobel Laureates who have devoted their lives to the service of knowledge and mankind," said Arthur Molella, director of the Lemelson Center and curator of the Nobel exhibition. "It will also showcase the human side of the creative process and examine the motivation behind these extraordinary individuals," he added. The exhibition will draw on the NMAH's substantial Nobel collection for the show, which includes Albert Einstein's pipe and geneticist Barbara McClintock's microscope. The show closes Oct. 31. For more information on the exhibition, visit www.si.edu/lemelson. Swedish celebrations include inauguration of "Cultures of Creativity: The Centennial Exhibition of the Nobel Prize," which the Nobel Foundation will open at the Nobel Museum in Stockholm on April 1. The exhibition will run through August 31, 2004. For more information about the Nobel Prize and the Foundation's centennial activities, visit www.nobel.se/. 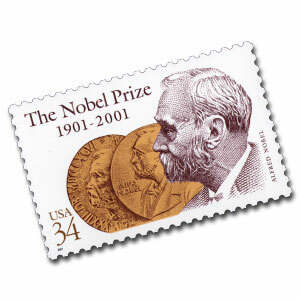 Thirty-five million Nobel Prize commemorative stamps will be printed for the March 2001 issuance.